While the first half of our trip to the Western Isles hadn’t involved much exploring of the Western Isles themselves, the second half of the week was dedicated to just that. 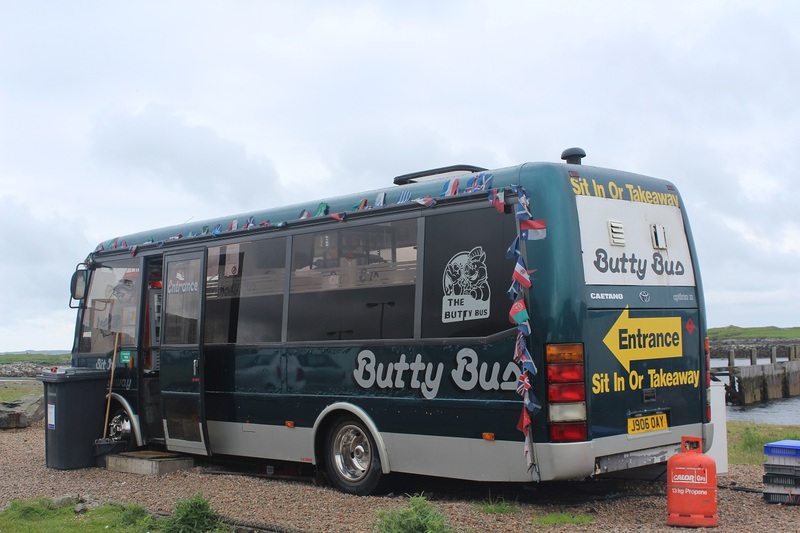 We kicked off the Wednesday with a visit to the Butty Bus in Leverburgh, which is a converted coach serving tea, coffee and hot filled rolls at breakfast time. They have some seats inside so we sat watching the general goings-on at the harbour while we had breakfast. A great little place! From the museum we headed toward Tarbert and then took the turning towards Scalpay to begin our walk to Eilean Glas lighthouse. We parked up near one end of the Heritage Trail and set off. Based on the mapping we’d used, we expected a fairly well-marked path to the lighthouse, but it wasn’t to be. Strangely enough there were some coloured posts along the way, but there was very little consistency with these and we ended up making it up as we went along! Once we’d spotted the lighthouse from a distance though we decided to abandon the post idea completely as we had very little confidence in them. There were some fantastic views of the red and white striped lighthouse on the approach with the Shiant Islands in the background. The lighthouse sits on a small peninsula and as we approached we could see there was a sense that there was a real disparity between the condition of the buildings there. While the stripes of the lighthouse were all perfectly maintained, the surrounding buildings were falling into disrepair, although it looked like efforts had begun to make improvements. There was a sign on the door of the old lighthouse keepers cottages saying that ‘Friends of Eilean Glas’ had been set up to improve the buildings following damage from vandals. It said that more information was available at the Scalpay Post Office, so we made a mental note to stop off there after our visit. 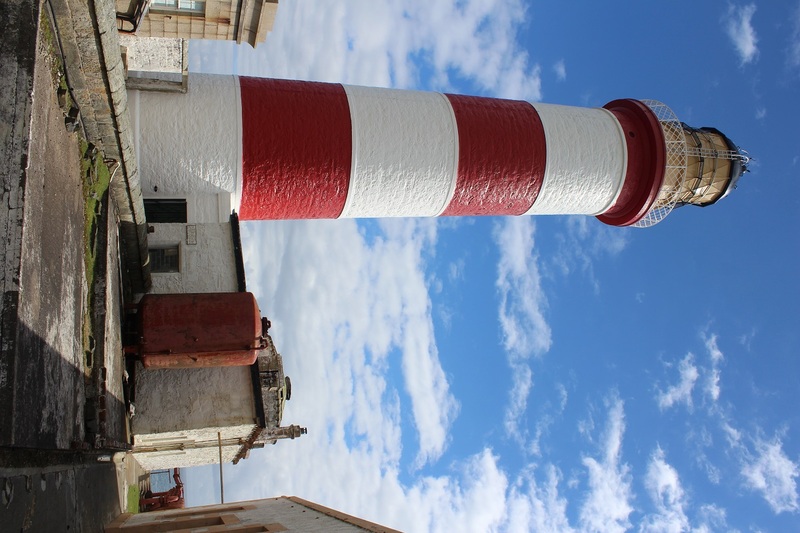 Part of the building that made up the old lighthouse is still present at the site and a plaque is on display explaining that it was one of the first four lighthouses to be built in Scotland and was first lit in 1789. The return journey from the lighthouse was a lot more straightforward. Bob was keen to reach the high point of Scalpay and we followed a path that seemed to go in the right direction. The path looked fairly new, which explained why it hadn’t appeared on our map and happened to run right back to where we had parked and alongside the island high point. 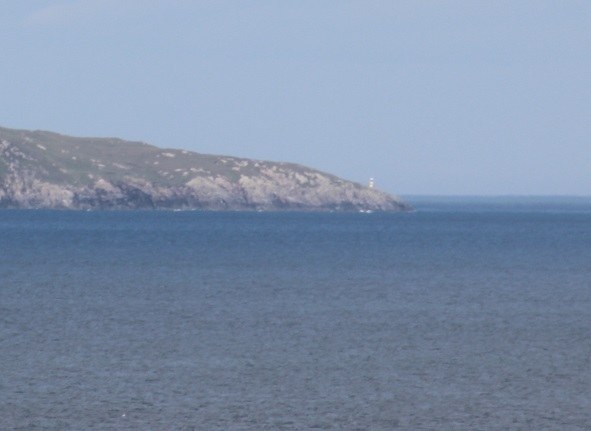 It also gave us a distance view of Gob Rubha Uisinis lighthouse, which sits further up the coast of Lewis. Based on the maps I’ve seen, this lighthouse looks to be the most remote in the UK in terms of access, with a lot of rough terrain covered in small lochs to cross. We were also able to see the northern tip of Skye as we walked back. As mentioned above we planned to stop off at the local Post Office to ask about the Friends of Eilean Glas plans. Having found the shop we asked the lady for more information and we were informed that there were currently no plans underway as the individual who had set up the trust was serving a prison sentence for fraud. It’s such a shame that everything has come to a standstill and hopefully someone with a genuine interest in making the necessary improvements steps in at some point. We grabbed an ice cream from the shop and Bob then drove us back to Lewis and to our campsite location for the night, Huisinis beach. 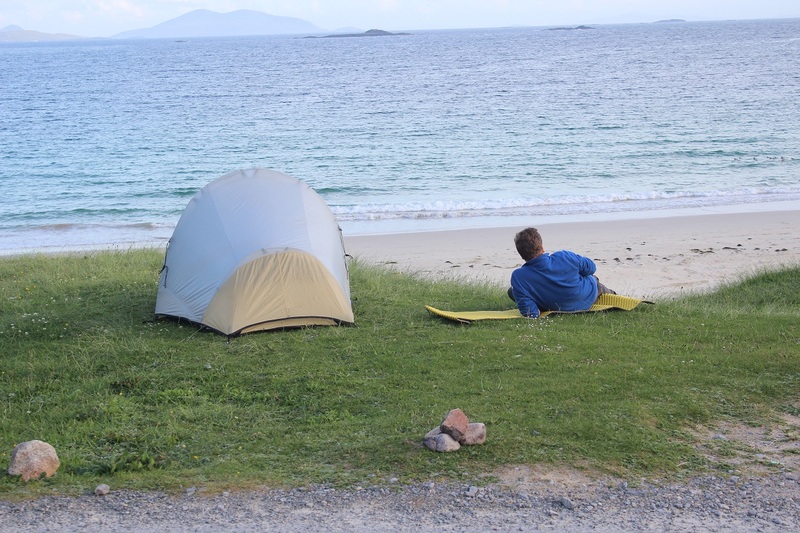 The local residents run a small bathroom block, which we took advantage of and Bob pitched the tent just above the beach with the doors facing the sea. We had our own little barbeque and then spent the rest of the evening enjoying the beautiful views of the beach.